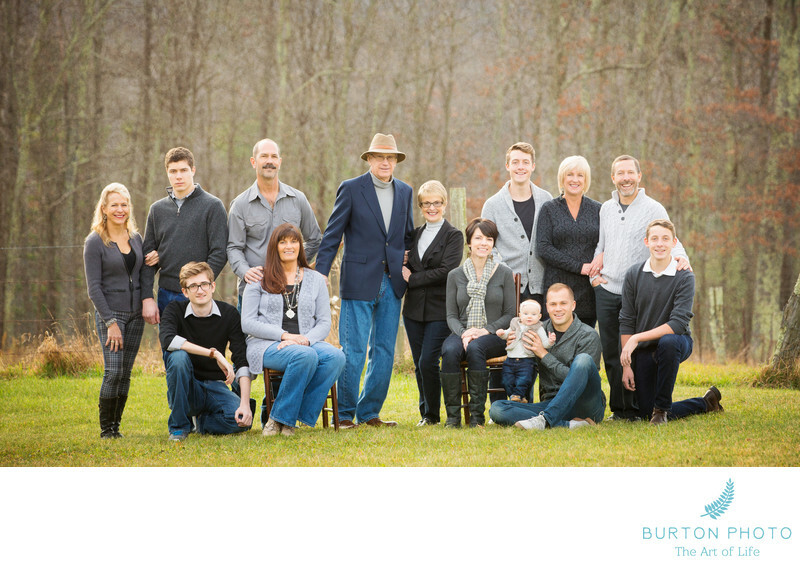 We met this family at their home in Banner Elk for a late fall/early winter portrait session. We could tell in just a few minutes how much this family loves each other and enjoys one another's company. We were thrilled to create this portrait that will help them remember the special weekend three generations spent together in the mountains of North Carolina. The town of Banner Elk is located in the center of the High Country. We love the painterly look the background takes on with the mostly bare trees. Their silvery colors are just gorgeous. Some people make the mistake of thinking that once the fall color is gone, portrait season is over. That couldn't be farther from the truth. While this portrait is very classic in it's nature with everyone looking at the camera, during this same session, we also created fun portraits of the family interacting with one another in a more photojournalistic, illustrative style. In the summer, residents and visitors enjoy the cool days - much like you would find in New England with high temperatures in the mid 70's. In contrast, the cold, snowy winters provide tourists with fun opportunities to play in a winter wonderland. Beech Mountain and Sugar Mountain are two popular options for snow skiing.